Total no of posts available in East Coast Railways Recruitment are 21 posts. Post Name: Sports Person: 21 posts. -Shuttle Badminton (Men): 01 post. -Weight Lifting (Men): 01 post. -Weight Lifting (Women): 02 post. -Volley Ball (Men): 02 posts. -Volley Ball (Women): 02 posts. Please go through the ECR Notification for qualification details. Age of the candidate should be below 25 years and above 18 years as on 01-01-2018. Relaxations admissible as per Odisha ECoR Govt rules. 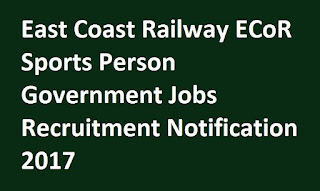 Candidates will be recruited for East Coast Railways Sports Person Jobs is based on marks secured in written test/ Physical Test/ Interview. Go through the ECoR notification for more selection process details. Application fee for other candidates SC/ ST/ PwD/ Ex- serviceman is Rs. 250/- (Fee can be refunded for the candidates actually appear for Selection process). Application form in prescribed format available at ECoR official website http://www.eastcoastrail.indianrailways.gov.in. Interested candidates fill the application and submit to the address before 18-12-2017. For remote areas candidates need to send application forms before 02-01-2018.